Disclaimer: I wear two hats, professionally speaking. With one hat, I write this blog and chair the MarTech conference series — both of which I try to run with a vendor-agnostic editorial viewpoint. However, with my other hat, I am also the co-founder and CTO of a marketing software company, ion interactive. While I rarely write about ion interactive here (my last such post was nearly a year ago), I do occasionally “cross the streams” when I believe that something we’re doing at ion has conceptual value to a much broader audience. In other words, you don’t have to become an ion customer to benefit from the idea shared. This is one of those posts. Today, we’re going to set aside our popular topic of aligning marketing and IT, and instead look at a different cross-departmental challenge — sales and marketing alignment — and discuss a new martech-powered approach that could open up innovative solutions to it. But let’s begin by examining the problem we want to solve. For most companies, the solution to this tension became a mix of lead scoring — an agreed upon algorithm for numerically ranking the quality and readiness of a lead — and a formal definition of MQLs (marketing qualified leads), SQLs (sales qualified leads), and the process flow from one to the other, such as SiriusDecisions’ demand waterfall. However, this wasn’t so much a breakthrough in alignment as much as a negotiated peace settlement between two separate countries, who share a common border. Trade policy and border control were established, facilitating commerce between them, but they were not one nation under a common flag. Which would have been fine, except for one thing: the buyer. SiriusDecisions has said that 67% of the buyer’s journey is done digitally. Lori Wizdo of Forrester estimated that for some companies it may be as high as 90%. There is a tremendous amount of context that buyers establish through interactions with digital marketing — but only a fraction of that makes it over the wall to sales in a usable format. Once a prospect crosses the tipping point of being “sales qualified,” and sales takes primary responsibility for the next stage of their buyer’s journey, the prospect still continues to interact with digital marketing touchpoints. Yet sales’ visibility into those marketing-led interactions, which are happening in parallel to their own dialogue with the prospect, still remain rather limited. As a result, the conversations that salespeople have with prospects often involve a redundant “two steps forward, one step back”-like dance. Thanks mostly to the explosion in content marketing, the prospect has likely progressed quite far in their understanding of how the seller’s solution fits their specific needs by the time they get on the phone with sales. But the salesperson is unable to discern just how far along that prospect really is without going over much of the same ground with them independently. From the buyer’s perspective, this dance means rehashing things with the salesperson that they already know from their interactions with marketing. From the salesperson’s perspective, it’s a delicate balance between wanting to leverage the knowledge about the prospect that was extracted through those marketing interactions — to accelerate the sales process, by tailoring their dialogue accordingly — but not rushing to hasty conclusions based on imperfect information. Nothing turns off a prospect faster than making inferences about them that are wrong. To me, this “context gap” is the real challenge of sales/marketing alignment. What about digital body language? One or more magic fields — such as a lead score or segment label — that attempt to distill a whole bunch of digital interactions into a simple, concise value. While such fields are helpful in marketing automation for routing leads and bucketing prospects into different nurture campaigns, they can be highly deceptive when used in sales discussions. It’s impossible for the salesperson to know exactly why or how that prospect was graded with a certain score or assigned to a particular segment. At best, they serve as hints that must be carefully validated. 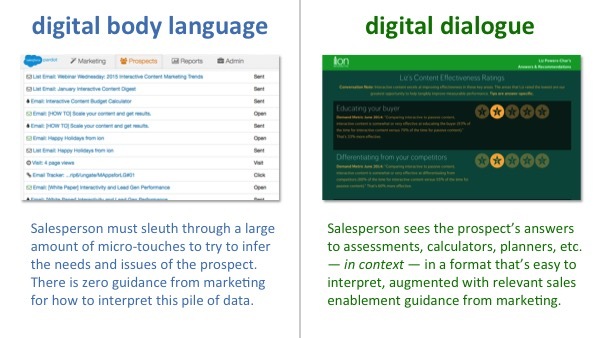 Digital body language, a term coined by Eloqua co-founder Steven Woods, is the set of actions taken by prospects in the digital domain that marketing software is now easily able to track: website visits, email opens, click-throughs, content downloads, etc. This was a breakthrough because marketing — and sales — could now see bursts of prospect activity in real-time, interpret it as a signal of interest, and respond with a timely outreach. Indeed, most lead scoring algorithms use digital body language as the primary factor in their calculations. Now, you may be tempted to say, okay, those “magic fields” might be a little suspicious — and they are — but shouldn’t digital body language provide us with a high-fidelity view of the buyer’s context? Just make the full history of a prospect’s digital body language available to anyone in marketing and sales, and boom, problem solved, right? While digital body language is valuable, there are two significant limitations to how much context we can infer from it. First, digital body language only reveals what is easily trackable. Bursts of activity are a good signal of interest, but they don’t directly communicate intent. You don’t know why that prospect clicked, opened, or downloaded something. And you don’t know how they interpreted that content into their internal narrative of their buyer’s journey. If you start making assumptions about the answers to those questions, you run into the dangers of hasty conclusions. For example, I know one company that dramatically downgrades a prospect’s lead score if their digital body language reveals that they clicked on the company’s hiring pages. The hypothesis is that someone who looks at their jobs-related pages must want to work there, so they’re not a good prospect for sales. Sounds plausible, right? Unfortunately, that hypothesis can be flat out wrong. I often look at the positions a company is hiring for as part of my due diligence of a vendor. I find it is a good indicator of their growth, their investment priorities, and even the way they characterize roles in their firm. If digital body language were truly working, they wouldn’t downgrade me as a prospect — they’d recognize that by the time I got to that level of due diligence I was a hot lead. Emails received. Emails opened. Links clicked. Web pages viewed. It scrolls on for many pages. Bear with me — we’re almost to the pay off. But there’s one more piece of the puzzle. You need to understand how interactive content has disrupted the environment of digital body language. 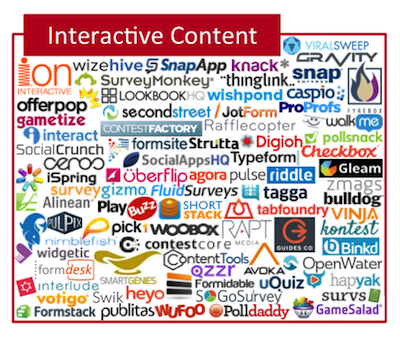 Last year, my company made a major shift to provide software for building interactive content. Interactive content includes things such as assessment tools, quizzes, solution planners, calculators, configurators, games — digital marketing touchpoints where the prospect actively participates in something. In fact, we originally called them “marketing apps” because they were very app-like experiences — except web-based, so you didn’t need to get approval from an app store, and your prospects didn’t need to explicitly install anything. So that alone would be a big win for marketing. More engagement, conversions, and social sharing from one’s content marketing. What more could a marketer want? But interactive content doesn’t just provide incremental improvement to existing marketing metrics. It’s far more disruptive because it collects a qualitatively different class of data from prospects than digital body language. Think about this data being collected. A prospect rates their organization’s capabilities and maturity level in an assessment tool. A prospect reveals what they know (and don’t know) about relevant subject matter in a quiz. A prospect maps out their stages of readiness in an implementation planner. A prospect inputs the parameters of their business into a calculator to estimate how much ROI they can get from your solution. If your eyes don’t bug out in amazement, read that last paragraph again. Salespeople would literally kill for this information. But it’s often difficult for them to get it from prospects, especially early in their relationships, because most buyers are wary of being led through these exercises with a salesperson. But they’re much more comfortable doing them on their own, as a self-service way of educating themselves and evaluating what you have to offer. My co-founder, Justin Talerico, calls this digital dialogue. Whereas digital body language is about inferring things from subtle behavioral cues, digital dialogue is when a prospect comes right out and tells you the information that is most relevant to their situation. However, prospects expect you will give them real value in return. The recommendations from your assessment need to be meaningful (and not just “we recommend you buy our product”). The corrected answers to your quiz need to teach something useful. The estimates from your calculator need to be credible. As a marketer building interactive content though, that’s fully under your control. But how can we leverage insights from that dialogue to deliver more value to a buyer’s journey downstream? Because marketing is probably not going to have a personal conversation with every prospect. At best, they may algorithmically apply some insights from digital dialogues in their marketing automation programs or for personalization, which, hey, is certainly helpful. But most of the data from a digital dialogue is, frankly, of a higher resolution than marketing can operationally use. It’s like a dog whistle that, ironically, marketing can’t hear — even though they catalyzed it with interactive content — but it drives salespeople absolutely wild. Yes, but, it turns out that’s only the tip of the bullet. See, that’s what we thought when we went to build our interactive content platform. We’ll just ship the information downstream into a marketing automation platform (MAP) or CRM, like we have with the usual contact fields and digital body language triggers before. Easy, peasy. But it’s not that easy. First, most MAPs and CRMs aren’t designed to accommodate all these different data fields — or it gets messy fast. Second, and more importantly, just passing along the data loses the buyer’s context in which that data was collected. How is a salesperson supposed to know what a particular data field from a multi-step assessment actually means in a vacuum? Remember, at the beginning of this post, I claimed that it’s actually such loss of context between digital marketing touchpoints and human sales conversations that is the thorny barrier in sales/marketing alignment. How can we preserve that context? Our first answer was: link the salesperson back to the interactive content. We’d pass a URL downstream into the MAP or CRM, which the salesperson could click to jump to a timeline of the actual interactive content that prospect had engaged with. Nice, but there’s a catch. How exactly should you show that prospect’s interactive content experience to the salesperson? The simple answer would seem to be: just let the salesperson walk through the experience themselves, pre-populated with the answers the prospect provided. True, that would show the data in context. But if you have a multi-step quiz, assessment, or implementation planner, that’s probably awkward for the salesperson to have to navigate through that step-by-step — especially if they’re on the phone with the prospect and could really use quick access to a specific answer or conclusion. Too much context of the buyer, not enough context of the seller. In most cases, you probably want to compress the experience to a certain degree — enough to make it efficient for the salesperson to use, but not so much as to lose the context in which the prospect provided this data. But how exactly do you compress it? There might be simple patterns for vanilla interactive content, such as quizzes, where you could just squash the questions and answers into a quick reference format. But for more bespoke interactive content, such as assessment tools and configurators and games — the kind of interactive content that we let marketers build with our software — there’s not a one-size-fits-all way of compacting those experiences. Here’s where the light bulb went off — and it’s an idea that you can take beyond our product. What if we let the marketer create a second version — a separate “side” — of that interactive content experience, one that was expressly designed for sales? Two-sided interactive content: a buy-side, built for prospects; a sell-side, built for sales. A common context. The same shared data. But two different sides to the experience, for the two different audiences interfacing with it. I’m not claiming this is rocket science. In fact, it’s easy to build a sell-side experience. 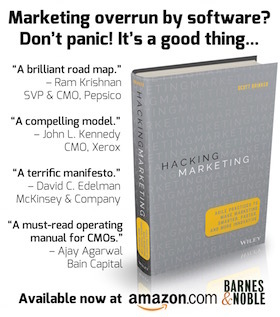 But conceptually, it enables a new kind of “coordinating device” between marketing and sales. Now, when a marketer produces an interactive content asset, they can perfectly frame the prospect’s data in the context in which that data was collected — into an experience that is crafted lovingly for sales. This sell-side experience can even include additional content just for the salesperson, such as links to related content, statistics, or case studies that they may want to share with a prospect, based on their particular answers. Since software is driving all this, you can apply simple logic to personalize the sell-side experience based on that prospect’s individual data — tailoring the recommendations to sales to best serve that specific prospect. Marketing empowers sales to seamlessly bridge marketing’s digital dialogue with sales’ human dialogue. That goes beyond improving sales/marketing alignment. It engenders sales/marketing love. It gives marketing and sales a shared “platform” to collaborate around the buyer’s journey. Sales can give marketing highly relevant feedback from their human dialogues to better improve the digital dialogues for a specific interactive content experience — which in turn better improves sales’ effectiveness when prospects are handed off to them. It’s a virtuous cycle. Instead of treating marketing content and sales enablement as two separate things, they are conjoined around the buyer’s experience and tailored to their digital dialogue. Ultimately, the real benefit of this is that it creates a smoother journey for the buyer. It helps eliminate the “gap” for buyers when they cross between marketing and sales touchpoints. So, as you can tell, I’m pretty excited about this. And if you want to see a demo of it in action with our product, please do reach out to us. But as I said in the disclaimer at the top of this post, I think this idea is much bigger than our product. As software drives more and more of the touchpoints between buyers, marketers, and salespeople, we have new opportunities to connect those pieces into more cohesive, multi-sided objects. We aren’t limited to merely shipping data downstream. We can ship whole interactive experiences downstream. How might we reimagine what’s possible with that power? If a salesforce is involved, both sales and marketing must agree on the definition of a ‘qualified lead.’ My definition is, a targeted buying persona has expressed curiosity about how we have helped a similar buying persona achieve a goal, solve a problem or satisfy a need. This sounds really useful in principle, but I can’t work out how to do it in practice. I guess I’ll have to “reach out to you” to see it in action! This is a brilliant article – When Marketing and Sales can move beyond their differences and align to work in tandem, they have the ability to increase the revenue cycle while cutting the cost of doing business at the same time. Most companies spend 30-40% of their revenue on Sales and Marketing. If these two sides of the same coin coordinate activities and better align themselves, they can optimize what their company spends on them. Also feel free to have a look at my product – http://www.intandemly.com. It solves the same problem!